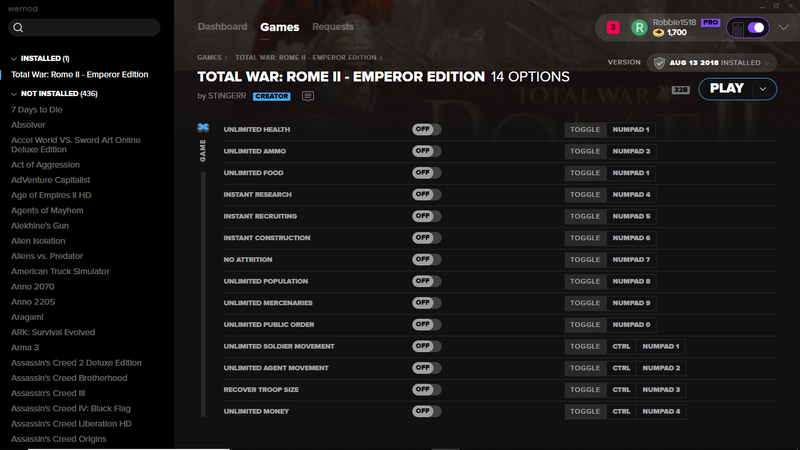 This is the official discussion topic of the Total War: Rome II - Emperor Edition Trainer and Cheats in the WeMod app. Please post any suggestions, bug reports, or praise that you may have for the cheats in here! 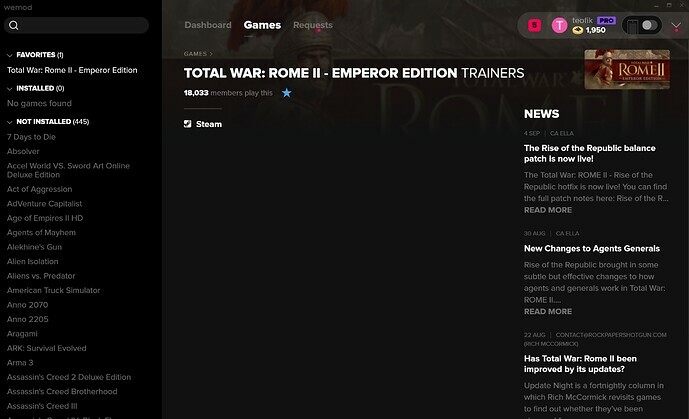 So I downloaded the WeMod app onto my computer, have Total War: Rome II downloaded onto my computer, and it recognized it in the app immediately. The trainer starts the game like it should, but I’m not sure how to use the trainer. It seems like it doesn’t recognize that the game is running, and the app that I’ve finally gotten to work on my phone behaves the same way. I’d just like some clarification on how to use this. Why i must click play twice to use the trainer? Instant construction does not work. I select a city, active the cheat and then queue a building for construction. I then end the turn, but the building takes the normal amount of time to complete. Any update when the trainer will be back up or will be back? 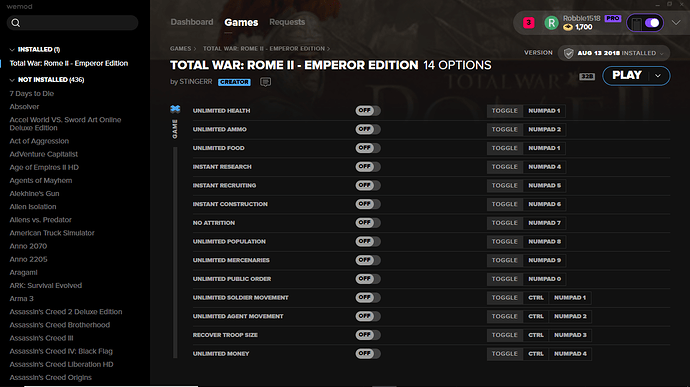 Load up Rome 2 launcher. Click Play on Rome 2 launcher. At this point on, none of the cheat work even if I am able to activate the cheat. Hello, was wondering when you’d be able to update this trainer? Kind of bummed about it not working. There is not a trainer for your game version. Update please? I know this has been requested a lot, but this trainer is a great thing! I use the trainer almost everyday and it’s kind of hard to play without it being updated. I really like this trainer, but as of a week ago it stopped working with my Rome Total war v2.40.0. Not sure what happened but would really like to see it working again. thank you in advance, Great work by the way Really Great trainer!!! Update please, it’s broken yet again. Please update !!! I payd PRO for this trainer. But thank you for buying pro. Now you can use the phone app ! I support the good guys that work for this trainers, but seems that i payd for nothing , the trainer dosent work for me. Thats sad. Just got the update on this didn’t get any message about it not working with my version, however in game none of the listed abilities of the Trainer are working, not sure why that’s on the programmer end I just wanted to post this so others may see it and know that it’s still not working right. when in game everything is vanilla, No special anything. Thank you so much for this trainer and the work you put into it, maybe soon it will work again. Can we expect a update to this some time soon?